Equal Water Shares for the peoples of Iraq and Iran – A call for collaboration to preserve the shared rivers! 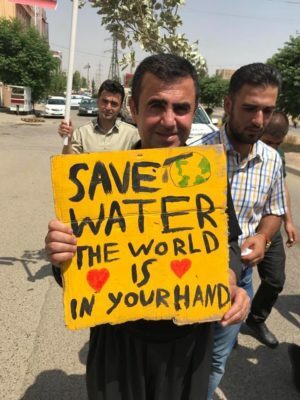 Home / Save the Tigris / Equal Water Shares for the peoples of Iraq and Iran – A call for collaboration to preserve the shared rivers! Recently dams have been seriously affecting the water courses of Iraq. The shared rivers of Iraq have seen decreases in water flows due to Iranian dams. In June, the Iraqi-Kurdish border region experienced large cuts in water flows of the Little Zab river – a tributary of the Tigris – due to Sardasht Dam, an Iranian dam which began to impound its reservoir on June 22 with immediate effects on Iraq. Lake Dukan and Lake Darbandikhan in the Kurdistan Region have experienced reduced water flows due to Garan Dam, completed in 2013 near Marivan in Iran, while Daryan Dam (recently completed) in Iran is set to affect the border regions in Halabja. All these dams were constructed in the past 15 years. In Diyala, the flow of the Alwand River (Sirwan in Kurdish) is stopped annually during summer due to Iranian dams. The Kurdistan Region of Iraq has its own shares of dams which in turn reduce water flows to the Central and Southern parts of Iraq: a chain reaction instigated by a series of dams in different countries and regions. These events demonstrate that to build new dams cannot be the solution against existing dams. These megaprojects have the potential to instigate great conflict between peoples in the region. The Save the Tigris Campaign offers a different course for the region: for countries to cooperate over shared water resources and an integrated management for all shared waterways. To this aim, the countries of the region have several legal instruments at their disposal: the Ramsar Convention (to jointly manage wetlands) or the 1997 United Nations Convention on the Law of the Non-Navigational Uses of International Watercourses. We urge all state parties involved to subscribe and adhere to these treaties. The aforementioned dams have been finished and are operating. Yet dam construction of other dams continues across all countries of Mesopotamia, including Iraq. The most immediate threat in Iran is the construction of Kharromud Toyserkan Reservoir on the Khoram Rood river in Hamadan province, Iran. This will have an impact on Hoor al-Azim and Hawizeh Marshes, the shared Marshlands of Iran and Iraq. Meanwhile upstream dam construction in Turkey (Ilisu Dam) continues to be a source of great threat for the preservation of these wetlands. We therefore urge concerned citizens to sign an Iranian petition against Ilisu Dam in particular. In line with our campaign goals, we oppose any construction of large dams on the Tigris River and its tributaries across the Mesopotamian Region. We call for the countries of the region, in particular Iran and Iraq, to start a profound dialogue in order to reach a lasting agreement on water sharing, especially in the border regions such as Diyala where water shortages due to Iranian dams have become an annual returning event, hitting the local communities hard. The negative effects of dams have been extensively described by experts and international institutions (see for instance the 2000 report of the World Commission on Dams). Save the Tigris Campaign promotes sustainable management and equitable sharing of waterways by all countries in the Tigris-Euphrates River basin in order to preserve the ecosystem and cultural heritage of the river. Dams deprive humans of equal shares of water – we call for water policies that foster cooperation instead of division!ion!